Mainly 2 story home can called duplex home. It is a 2 ground constructing. A duplex home plan is a multi household house consisting of two separate units but constructed as a single dwelling. Duplex house plans are very famous in high density areas similar to busy cities, open place or no costlier waterfront properties. 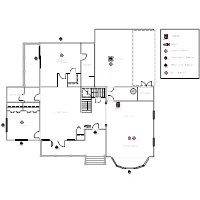 So, Download a Duplex House Plan in Auto CAD File.